You are here: Home / health tips / DAIRY: Is It Really That Bad for You? Are dairy products really bad for you? In the old days you would buy a quart of milk and the top portion of the bottle would be the cream. Now, that cream is mixed throughout the entire carton of milk. You can’t see it but it is there in whole milk. 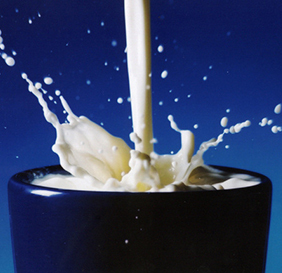 Whole milk contains about four per-cent butterfat. That reads as 6 grams of saturated fat on the nutrition facts label. Skim milk has all the fat removed. It doesn’t take a genius to figure it out — if you want to decrease the amount of fat you put into your body, begin using skim milk on a routine basis. (or almond milk or soy milk). I recall when I first realized how much fat was in milk. It was stunning to me, as a physician. I read that the fat I would consume while drinking a glass of whole milk is equivalent to eating five strips of bacon. I couldn’t even imagine how much fat was in a half-gallon of whole milk. I don’t know why certain little statements like that make me change my eating lifestyle, but the more I thought about it, the more I began to reason that I should cut back on whole milk consumption. I will never forget drinking my first glass of skim milk. It felt and tasted like water. I knew it was a taste I would never grow to like. But I kept thinking about fatty bacon and it wasn’t too long before skim milk tasted “normal” and a sip of whole milk made me wonder why I ever liked it in the first place. So when you think of milk, you have to also include that cream in your mind picture. That takes ice cream out of your eating lifestyle. As well as cream sauces restaurants want to pour over your grilled fish. As well as cream based soups you eat because you forgot to ask if the soup you were ordering was cream based or not. As well as so many deserts that taste so good, and cream cheese, and whipped cream. The list goes on but the main emphasis in Prescription For Life is to teach you what certain foods do to your arteries that determines your aging process. You want to stay as young physiologically as possible for as long as possible. You want to peak at 90.